Prominent & Leading Manufacturer from New Delhi, we offer bopp self adhesive tapes. BOPP Self Adhesive Tapes are manufactured on fully automatic plants, with latest technology, thus have distinct products advantage in high tensile strength, superior adhesion, all weather proof, longer shelf life and can withstand low and high temperatures. We specialize in plain and printed Packaging Tapes(Brown/ Transparent) suitable for industrial packaging and export cartons. 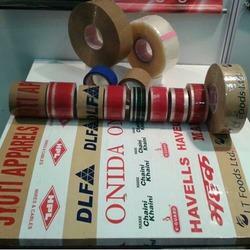 Width of tape normally available in sizes 9mm, 12mm, 18mm,24mm, 36mm, 48mm, 600mm & 72mm. Other widths can also be made against orders. Jumbo Rolls of length 650 metre available for automatic carton sealing machines. Looking for BOPP Self Adhesive Tapes ?